HomeHow ToHow to Sync Settings Across Devices on Windows 10. Here’s how to manage and sync settings across multiple devices on Windows 10 desktop PC, laptop, tablet and phone. Microsoft has added a feature in Windows 10 Settings app that makes it easy and fast to set settings on one device and sync them to enable those settings automatically across multiple devices running on Windows 10 linked to a same Microsoft account. This way you won’t have to set settings on each device manually, they will be automatically ported and enabled across devices, thus saving you time and effort in the process. If you are singed on with your Microsoft account on Windows 10, you can use it to sync Windows 10 Settings across all your Windows 10 devices on which you are using the same Microsoft account. With this syncing feature enabled on your PC, you can use it to sync Windows 10 language preferences, passwords, theme, Microsoft Edge Settings. Moreover, you can also use it to set and sync hardware settings, printer, mouse, sound and others, in addition to notification settings in the action center as well as File Explorer settings. Since Microsoft’s new policy centers around streamlining Windows 10 experience across multiple device for its users, this settings syncing feature is a part of that strategy as it allows fast syncing of settings to help users get the same Windows 10 experience on multiple devices. We understand that this feature may not be to everyone’s liking as some prefer to keep different configuration settings on different devices, but it’s not without its merits either. If you like to keep different themes, settings, hardware configurations on different devices, then this may not the option for you. In Windows 10, you can sync settings across devices, if you like having the same experience on all your devices. 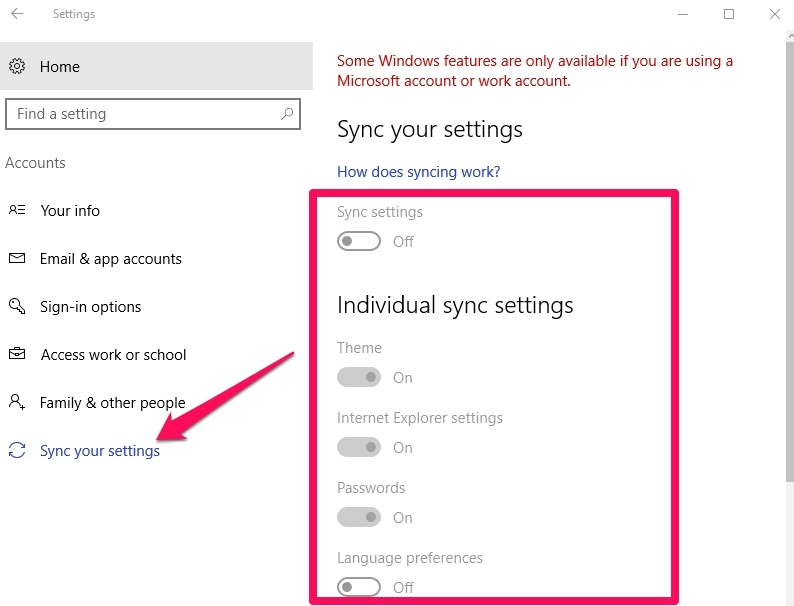 You can choose to enable sync settings for all or selected features on Windows 10. Moreover, you can disable this feature as well, if you like. Here’s a step-by-step guide on how to sync Windows 10 across multiple devices, and to disable the option if you don’t want to use it again. 1 – Go to Settings on Windows 10. 2 – Click on Accounts option in Settings. 3 – Now, click on Sync your settings. 4 – You will now see two options to enable or disable Sync settings by turning the toggle next to it to on or off position. It’s as easy as that to sync settings across multiple devices on Windows 10. For feedback and further help, get in touch via comments below.